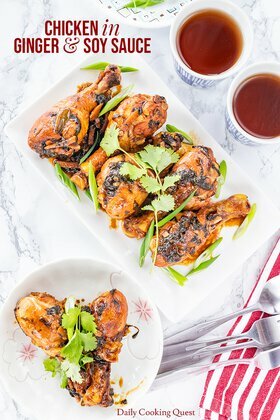 Last week I received a question from my reader if there is a way to bake the chicken strips for many of my fried chicken recipes. It got me to thinking, and after experimenting a bit, I think the recipe that I come up with should work. 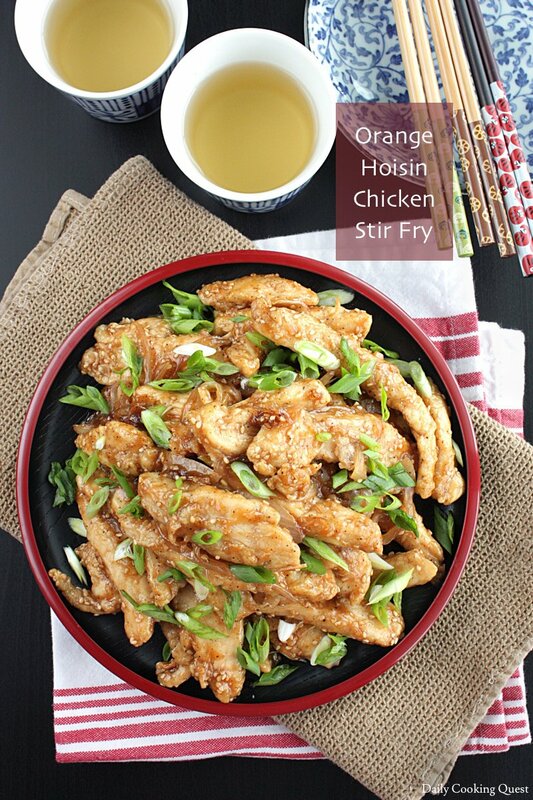 And since I don’t want to repost one of my old fried chicken recipes with the only change being the “fried chicken” turned into “baked fried chicken”, I am going to share this recipe for orange hoisin chicken stir fry instead. Like I said, the main trick for this chicken recipe is to creat fried chicken strips with an oven. I have to say that the baking version is super simple, not to mention, perfect when you don’t want to do any deep frying. That said, the oven baked fried chicken strips look decidedly less golden brown compared to the deep frying version. They are still fully cooked though, so have no worry. 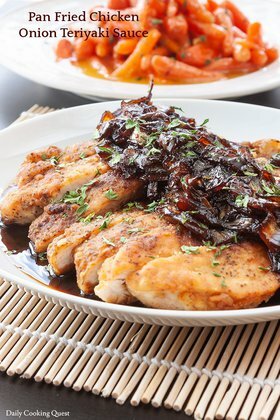 The good thing is that since we are going to coat the chicken strips with lovely orange hoisin sauce, your chicken will still look invitingly delicious. 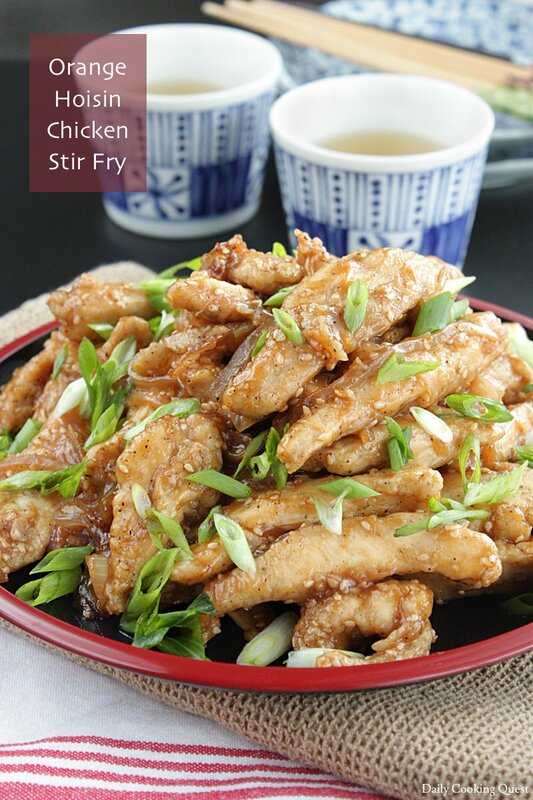 Mix together chicken strips with salt, ground pepper, garlic, lime juice, and tapioca starch. Let the chicken rest for 15 minutes. Preheat oven to 200 Celsius (400 Fahrenheit), and line a baking sheet with parchment paper. Just prior to baking, lightly dust the marinated chicken strips with all purpose flour, then place on the prepared baking sheet. 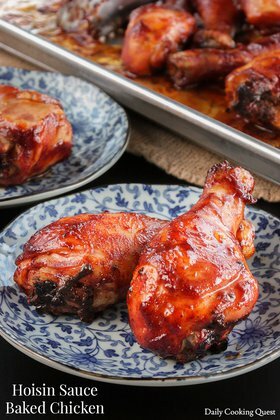 Bake in preheated oven for 10 minutes, then flip the chicken, and continue baking for another 10 minutes. Melt butter in a large frying pan/wok over medium high heat. Sauté onion and garlic until onion is translucent, about 3 minutes. Add hoisin sauce, worchestershire sauce, orange juice, chicken stock/water. Mix well and bring to a boil. Season with salt, pepper, and sugar. Adjust according to your taste. 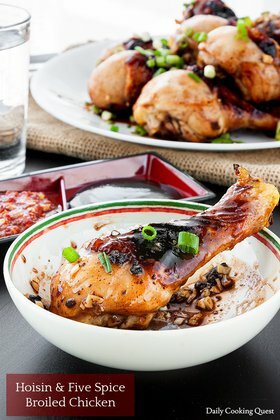 Continue cooking until the sauce is reduced and thick, then add the baked "fried" chicken strips and toasted sesame seeds. Toss to gently coat the chicken with the sauce. Turn off heat, transfer to a serving plate, garnish with thinly sliced scallions and serve immediately. I made this for lunch with soja stripes and curcuma rice noodles. What a delight ! 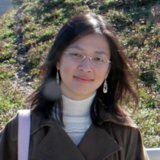 Your recipes are wonderful ! Soja stripes! That's a great idea to turn this into vegetarian friendly dish.